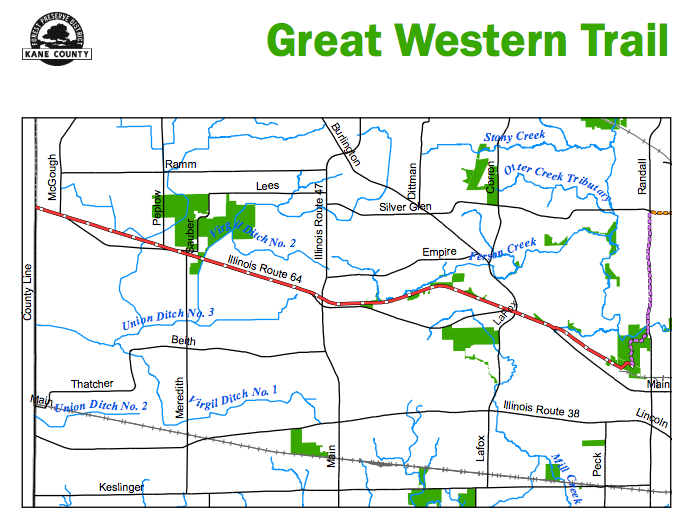 This map shows the full length of the Great Western Trail. The route of the bike ride will be about 10 miles, round trip. Join Forest Preserve District Naturalists as we enjoy a leisurely bike ride along the Great Western Trail, July 26. The Great Western Trail spans 14 miles and runs parallel to Route 64. Walkers, bikers, runners and horseback riders all use the trail and enjoy the beautiful streams, flora, fauna and remaining patches of native prairie. Participants will meet at Creek Bend Nature Center for a quick safety check, and then we will hit the trail! We’ll enjoy the natural features and native scenery. Riders will also have the opportunity to learn about the natural and cultural history of the trail. The ride will be around 10 miles round-trip. The “Bike the Great Western Trail” program will take place from 9 a.m. to 11 a.m. Saturday, July 26, at Creek Bend Nature Center in the LeRoy Oakes Forest Preserve, located at 37W700 Dean St., St. Charles. There is no fee, but advance registration is required. Please call 630-444-3190 or email programs@kaneforest.com. For more information, or to view a full list of upcoming Forest Preserve District programs, please visit kaneforest.com.